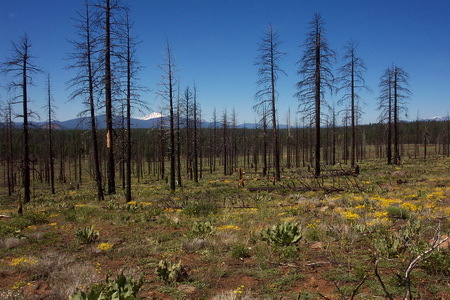 One of the partially harvested treatment units of the “Variable Retention Salvage” study on the Blacks Mountain Experimental Forest, Lassen National Forest, Calif., in June 2006, four years after the Cone Fire and three years after salvage harvest. Snapshot : After the 2002 Cone Fire burned into the Blacks Mountain Experimental Forest on the Lassen National Forest in northeastern California, scientists from the Forest Service’s Pacific Southwest Research Station installed treatments varying in salvage harvesting intensity, ranging from untouched to all fire-killed trees removed. They evaluated vegetation recovery at two-year intervals between four and ten years post-wildfire. Data showed that while vegetation changed over time, the cover and probability of occurrence for most categories of plants differed little between units that were salvage logged and units that were not. When timber is salvage-logged after a severe wildfire, one concern is that mechanical disturbance might set back recovering native vegetation and increase invasion by non-native species. Following the 2002 Cone Fire on the Lassen National Forest in northeastern California, Forest Service scientists from the agency’s Pacific Southwest Research Station applied five salvage harvesting to field units formerly dominated by ponderosa pine, covering a range of disturbance intensities from not salvaged to 100 percent salvaged. They monitored under story vegetation between 2006 and 2012. Numbers of both native and non-native species did not differ among salvage treatments, but both showed strong changes over time. While cover of forbs and grasses did not differ with salvage treatment, cover of shrubs that germinate from seed was significantly reduced at the higher salvage intensities, likely due to mechanical disturbance from logging. Native perennial species that emerge from rhizomes or other deeply buried underground structures were less affected by salvage harvest. Over time, the plant community in all salvage treatments shifted from dominance by shrubs and forbs to shrubs and grasses. Most of the grasses were native, except cheat grass, which increased dramatically over time in all salvage treatments. The results show that under story vegetation change post-high-severity wildfire appeared to be influenced more strongly by factors other than salvage logging.